When I was a kid, I regularly tried to convince my mother that making the bed was a waste of time. “Why bother, Mom? !” The covers would only get messed up again later that night when I went to bed. I think her response was something like, “Why should I bother cooking dinner, then? You’re only going to get hungry again.” Touché, Mother. Touché. Unmade beds and sarcastic mothering aside, I’ve noticed a lot of my peeps – myself included – tend to get a “why bother?” attitude towards our creative projects. We get a creative block, so to speak. There are a multitude of reasons why we should bother. I’ll get to that in a minute. But first, my inquiring mind had to analyze where “why bother?” comes from. I came up with a few different possibilities. My initial thought was: It’s just laziness or disinterest. Why bother? Meh. It’s too much work. General malaise. Sometimes we convince ourselves that some activity will be so, SO cool, when in reality we’re just interested in the coolness of it, and not the actual doing of it. Sure, that’s the issue sometimes. Or in my case, many times. But what about the things that I KNOW I’m meant to do? So I thought: Ah! Perfectionism. Now, there’s a real bugaboo. Why bother? It won’t be good enough. Or my ideas are nothing new. Sometimes we let our confidence take a hit. We get discouraged under the weight of comparison. Then I realized, a lot of the time, it’s about fear. That’s probably even the foundation of the perfectionism thing. Fear can be our friend, and keep us from harm. But it can also be our enemy and keep us from experiencing life, trying new things and learning from mistakes. Mistakes are an important part of this equation. I’ll get to that more in a minute. Examples: I want to make an online video-based class but the idea of seeing myself on camera gives me the willies. Or I want to interview a blogger who I admire but the idea of calling her, and possibly being turned down, causes an explosion of terror in my gut. Do any of these responses – Meh. — Perfectionism — Fear – strike a chord with you? For the “meh”s – be honest with yourself. If it’s not really buttering your biscuit, walk away. If you’re the kind of person who gets themselves into a jam (eg. you invested a ton of money in a fit of excitement and then realized it wasn’t what you really wanted), chalk up your former jams to a learning experience and institute a cooling off period for yourself before you lay out a ton of money, time or other resources to something without considering that it might not be worth your money, time and other resources. For the perfectionism – look at things with fresh eyes. Like you’ve never seen anything different. We are our own worst critics. We compare ourselves relentlessly with others. And the irony is, while you are wasting time moaning about things in your life not being as good as Jane McCool next door, she is most likely cruelly comparing herself to someone else… maybe even you! STOP THE INSANITY! (check out that 1990s Susan Powter reference!) Now, I’m not saying that you should do a crappy job or that you shouldn’t do your best. But I’m suggesting that YOUR BEST is just right. And if you would like to do better, then practice. Be proud of what you can do right now because it’s an expression of you. If it’s your goal to build your skills or polish your abilities, then that’s wonderful. But stop striving for unattainable perfection. 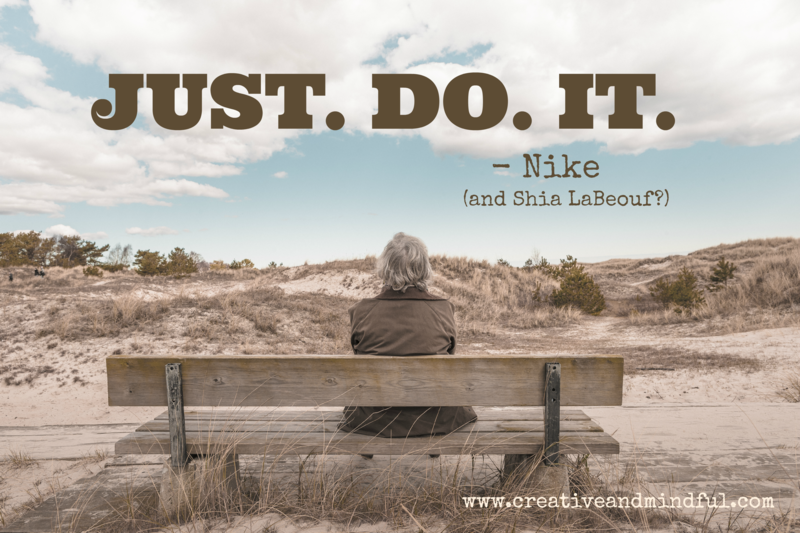 For the fear – just do it. Take a deep breath and leap. Now, I know what you’re going to say. “What if that’s a mistake and I totally ruin my life by leaping? !” Well, I’m not advocating that you play with loaded guns. Or distribute copies of your bank account password at the bus station. I’m talking about calculated risks. When common sense says, “yeah, this is a smart thing to do!” , then do it already. Quit thinking about it, researching it, talking about it and DO. IT. You might need to learn the difference between the gut instinct that something isn’t right and the butterflies in your stomach saying that your confidence is just being a little cowardly. Again, much of the time, common sense can help you with this one. And by DO. IT., I mean take some action. I know some things take time. There may be many steps involved, but at least get some skin in the game. You’ll be miles ahead of most people in that respect. Oh, and yeah, I said I would address the reasons why you should bother. You should bother because you are unique, and whatever it is that you want to put out in the world, or use to improve your lot in life, it is important. Whether you are a visual artist, a designer, a singer, a musician, a dancer, a cook. Or a person who enjoys expressing yourself in some special way. Whoever you are and whatever thing you do. If it brings you happiness and has the potential to bring others happiness, even if it’s just a handful of people on the other side of the world, then you should most definitely get out there and do it!